풍부하게 함유된 귀리를 구운 제품으로 진정한 영양을 섭취할 수 있습니다. 7가지 혼합된 곡물과 천연재료를 결합한 제품으로 수제 쿠키의 맛을 느낄 수 있습니다. Sweetly tempting, these whole oatmeal treats have chunks of dark chocolate in every bite. With real nutrition baked in, Kashi® Cookies make your sweet tooth naturally happy. Enjoy every delectable bite of rich chocolate and the goodness of our whole grain oats. 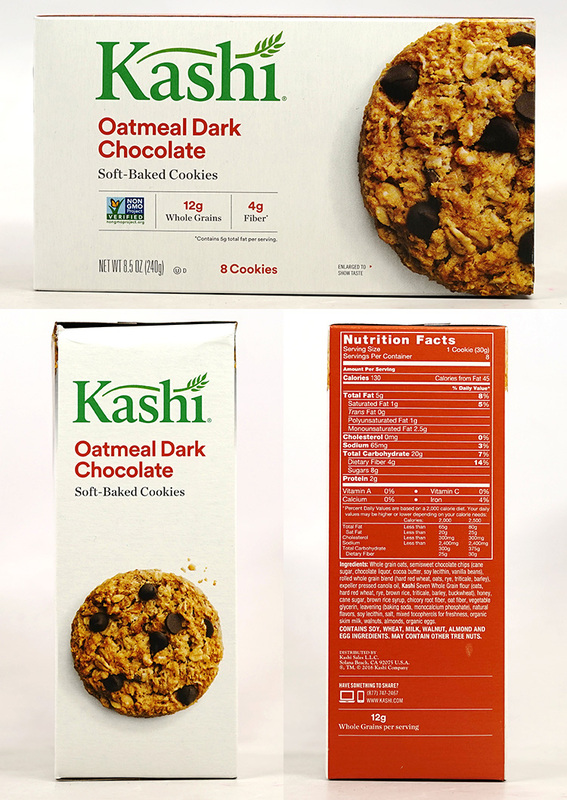 The Oatmeal Dark Chocolate cookie is a soft and chewy little indulgence made with rolled whole oats and rugged chips of dark chocolate, plus real nutrition baked right in. CONTAINS SOY, WHEAT, MILK, WALNUT, ALMOND, EGG AND PEANUT INGREDIENTS. Whole Grain Oats, Semisweet Chocolate Chips (Organic Cane Syrup, Chocolate Liquor, Cocoa Butter, Soy Lecithin, Vanilla Beans), Rolled Whole Grain Blend (Hard Red Wheat, Oats, Rye, Triticale, Barley), Expeller Pressed Canola Oil, Kashi Seven Whole Grain Flour (Whole: Oats, Hard Red Wheat, Rye, Brown Rice, Triticale, Barley, Buckwheat), Honey, Dried Cane Syrup, Brown Rice Syrup, Chicory Root Fiber, Oat Fiber, Vegetable Glycerin, Leavening (Baking Soda, Monocalcium Phosphate), Natural Flavors, Organic Soy Lecithin, Salt, Mixed Tocopherols For Freshness, Organic Skim Milk, Walnuts, Almonds, Organic Eggs, Peanut Flour.